Today’s blog is about the horse shown below. I snapped that picture outside of Seaside Market and across from Starbucks in a sleepy little coastal town called Cardiff by the Sea. You might ask what the horse below has to do with custom POP displays. A lot, actually. The element of surprise- If you encounter something unexpected, two things happen: (a) You are more likely to notice it and pay attention to it, and (2) you are more likely to remember it. In their book Made to Stick, brothers Chip and Dan Heath tackle the question of why some ideas stick, while others die. One of the key ingredients of “sticky” ideas is an element of surprise. In the same way that the element of surprise or a twist in a plot can help you remember a story, incorporating the unexpected in a POP display will help to engage shoppers at a deeper level than might otherwise be the case. Use of Color- The colors on the horse are bright, captivating and positive. If this were just a regular brown horse, people might casually admire it, but there would not be a steady stream of people pulling out their iPhones to take a picture of it like I observed this mid-summer morning. Artistic- There is nothing extraordinary about the horse itself. In many ways, it is a bit generic. However, the way in which the art work is applied to the horse really make it a work of art. People notice and pay attention to works of arts. Making your display a work of art can help you achieve similar results. Tells a Story- This horse is telling a story about “Del Mar Sunset.” Horse racing at the Del Mar Racetrack is a favorite past time during summers in San Diego. You can see the racetrack facility painted on the side of the horse, and what can be better than watching the races at sunset and cashing in on the Pick 6 you just won. Like the horse of many colors, all great custom POP displays have a way of telling a story about your product or your company. Execution Excellence- The originator of the idea of having a multi-colored horse in front of a little grocery store might not have won instant support from his or her colleagues. However, the concept was so well executed that it captivates anyone passing by. If you have an out-of-the-box idea for your next custom POP display, chances are you’ll have a good shot at success if you execute the concept well. Informational- Sure, having a horse of many colors is bound to capture attention, but that alone is not enough. Once the horse does its job of getting people’s attention, the sign below provides the information and messaging that the creators of the horse want to communicate. Similarly, attention-getting and messaging are critical elements in the world of merchandising. 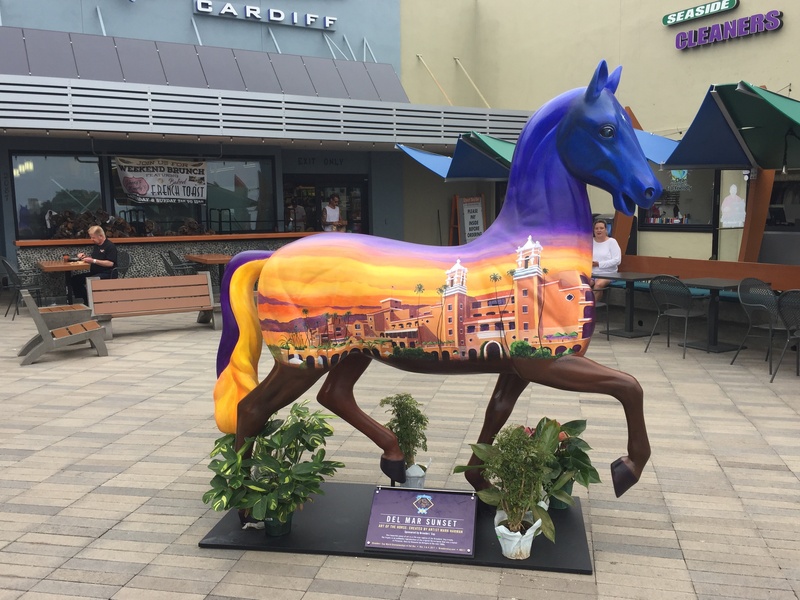 Strategically Positioned- Our multi-colored horse was strategically placed smack in the middle of the plaza through which shoppers must pass to enter Seaside Market and around which people congregate. If you are anywhere near the plaza, you can’t miss it. Same is true for POP displays: if you have a great display in the wrong location in a store, your display will most likely underperform. The old real estate adage “location, location, location” also applies to POP display placement in retail stores. Positive Energy- As mentioned in point number 2, the horse’s colors gives off positive energy. There’s a sense of life, fun and vibrancy that help to create a positive vibe around the horse. The fact that the horse is in motion adds to the energy. Imagine if the horse were in a grazing position. You would not draw the same energy from the horse. To engage your audience, think about how your POP display can give off positive energy. Unique- The horse in the picture is unique. Most of us have never seen a horse like that. Uniqueness stands out. Whether you are trying to sell tickets to the racetrack or trying to sell more of your product in a retail store, being unique is the best way to stand out from the crowd. It’s akin to what Seth Godin talks about in his book Purple Cow: Transforming Your Business By Being Remarkable. Presence- In addition to its striking colors and unique characteristics, this horse has presence. The horse has good posture and perfect form. Her ears are attentive, and she looks ready to go. In short, she’s got presence. Like this horse, your display needs to stand for itself, communicate authority and command attention. Larger POP displays tend to have more presence than smaller displays, but even a smaller display can be created to have a presence that can provide an edge over the competition.